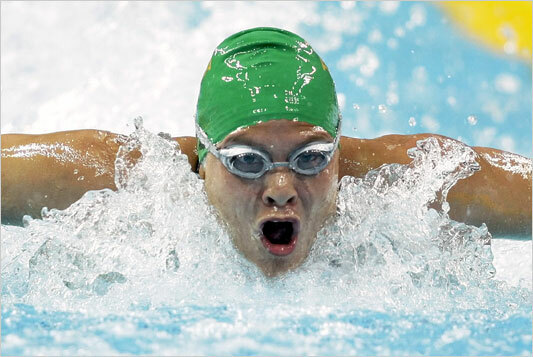 Natalie Du Toit, the South African who won five gold medals at the 2004 Paralympics and who finished 16th in the 20-kilometer open-water swim three weeks ago at the Beijing Olympics, added another Paralympic gold to her collection on Sunday when she won the 100-meter butterfly in her disability class. Natalie Du Toit, an amputee swimmer who qualified for the able bodied 10 km swim in Beijing, has just placed 16th in that event, more than one minute behind winner Larisa Ilchenko of Russia. She had kept up with the lead pack for most of the race but could not keep up when the pace quickened in the latter part of the race. She was disappointed with her result hoping for a top five placing. She plans to be back in the London 2012 Olympics in that event. She will be staying in Beijing for the next month to compete in the Paralympics. Being an L1 paraplegic who also swims to keep fit and who grew up as a competitive swimmer, I was amazed when I read about this South African amputee swimmer who made it to the Beijing Olympics in the able bodied 10km open water swim. Natalie Du Toit was amputated through her left knee after being hit by a car back in 2001. She does not use a prosthetic leg when she swims. She recently came fourth in the Open Water World Championships where she qualified for Beijing. I am looking forward to seeing how she performs at the Olympics later this summer. This article talks more about her story. I decided to blog on this after reading about Oscar Pistorius on the post by Spirit of the Time. Update ( 08.08.08 ) by Spirit of the Time: see also this more recent What Sorts post on Natalie Du Toit, written just before and after the opening ceremonies at the Beijing Olympics. Update ( 20.08.08 ) by Spirit of the Time: see also this recent What Sorts post on Natalie’s 10km swim results.